The last month before the wedding was pure craziness. The thing about hosting a wedding on your property is that the work legitimately never ends. We eventually got to a point where it was "good enough", but we both felt like we could have done so much more. The beautiful ceremony and reception area could not have been achieved it weren't for many people that helped make it happen. Seriously, I could start naming names, but that's not the point of this post. I do want to touch on the incredible amount of work Mr. Narwhal and my dad put into making it all come together. Mr. Narwhal certainly wanted to throw in the towel many times, but still would come home from work and go up to the wedding spot to work away all summer long. My dad, helped make some serious things happen with the borrowing of my Uncle's machines (which I talked about here). In the final weeks my dad came and helped several times and really turned our anxiety around. We finally could see it happening and felt slightly less crazy for ambitiously deciding to host on our property (i.e., create a venue from scratch). About eight days before the wedding we set up the tent* and we only had the final touches to put on. Mr. Narwhal and I had planned to get a truck load of mulch to pretty up some of the areas that looked a little rough (exposed roots by the tent area and around the cabin). After setting up the tent I asked my dad if it would be able to borrow my uncle's dump truck to get a load of mulch for us. He was happy to do it and said he would bring it the next morning. Perfect. The next morning Mr. Narwhal went to run some errands and I was cleaning up the house. In order to get to the wedding spot, you have to drive past our house to the second driveway. 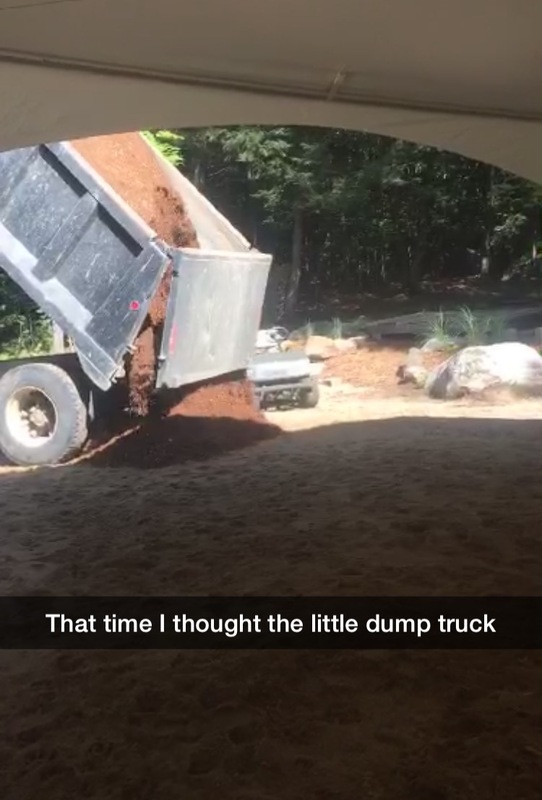 I could hear a big truck coming, and that when I looked outside and saw my dad driving by with a Mack truck sized dump truck. I immediately started to panic, because I completely forgot my Uncle had two dump trucks, one much smaller dump truck (that I had meant for my dad to borrow), and the Mack truck. I started darting around the house in a panic and ran up to the wedding spot as my dad was backing up the hill. The first thing he said was, "Boy, mulch is pricey!" 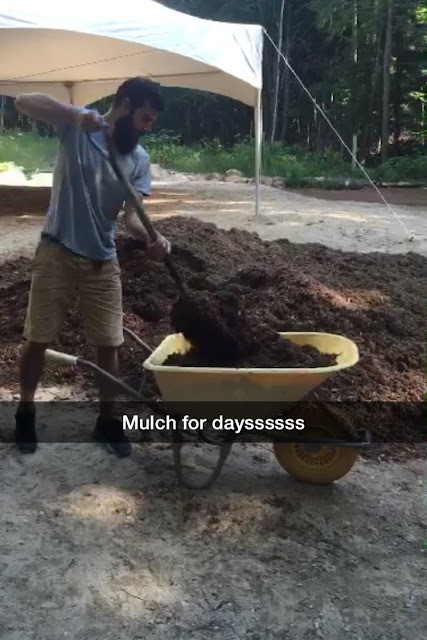 After explaining the mix up and both having a good laugh, we were left with a giant pile of mulch to spread. 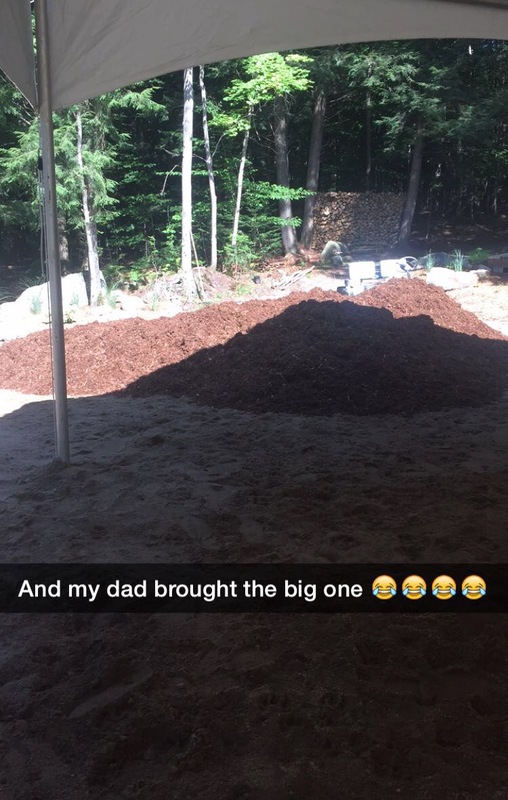 Thankfully my dad knew the guy working the place he purchased the mulch, and received it for a steal of a price, which was only marginally more expensive than full priced mulch would have been with the smaller truck. The remainder of the weekend was spend spreading mulch. 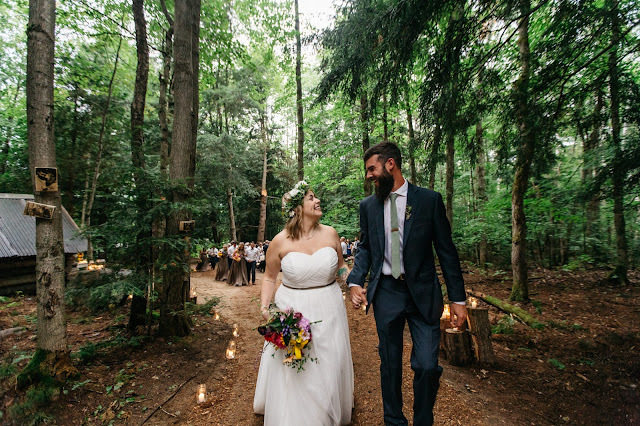 There was literally enough to cover the original planned areas, the ceremony spot, the paths, the toilet area, food tent area and make a dance floor. It made the biggest difference and really pulled everything together in the most beautiful way. My dad saved the day with our minor miscommunication, and the story of the mulch and Mack truck will forever make me smile and laugh. Did you have any miscommunications that worked out for the better? *Since we borrowed the tent from a family friend, we were able to set it up much earlier.